Here is a link you can follow for Viper Paranormal. Their videos have been very helpful to us. 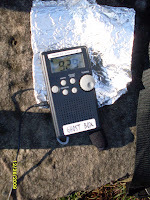 The aluminum foil is their idea to help control the amount of radio signals you receive. However, even they make it seem easier than it really is. 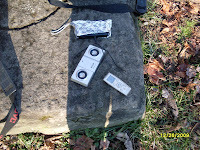 For one thing, if you have your ear trained to listen for regular EVP, throw that out. It will not help you with the Ghost Box. You have to listen for one word answers for the most part that sound like regular voices. You also have to take into consideration your location. We chose Gretchen's Lock because it is in a valley and radio signals would be minimal. Perhaps, not enough in fact. 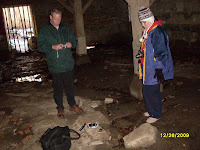 We are headed to The Diamond House in East Liverpool again soon and we will use it there to see if we can get anything. We will also have it at Thompson Park on January 9 for the next walk there. We tried in three places down at Gretchen's. First where we found the large stone with the carving on it, by the restroom. Then we went to where the house once was. Sitting at a Picnic table we tried to talk to the little boy who haunts that area. Then we went to the Grist Mill. The best we got so far is getting the color of our coats said at the site of the old house. Mine was red, Cheri's was blue, and Dave's was green. We heard the colors of Red and Blue said over the speaker. Another thing you have to consider is the questions you ask. For example, we asked for the colors of our coats that we had on. We asked for our names to be said. We asked if they knew what Holiday it was. We were looking for current information that was not just random, like yes or no. We recorded every session, but I was having the hardest time because I keep listening for regular EVP. I tune out anything louder than a whisper. It is frustrating and will take some practice. 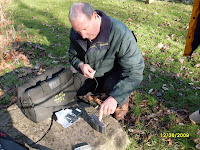 If you are working with the Ghost Box and have any tips, stories, or problems with it, please leave a comment or email me about it. I will be sure to post regularly about our progress with it also. Right now my crew and I are not real happy with it, but we are not giving up on it yet. There may be situations that is works better than others. We won't know until we try. You will see us with it a lot this year. Sounds like you got lots of good exposure to it in different places. Good luck and keep posting about it. I'll be interested to see how it goes. We have been using the ghost box on and off. Some have been good sessions and some seem to come out with nothing. 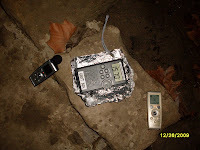 We have also used the aluminum foil to limit radio interference and it did just that but, evp's have been much quieter so i guess that's the loss; however just about everything that did come through were good answers. im still a bit skeptical with it though.